This surface can also be painted with whatever design you wood like. I designed packet PP-330 for this surface. Measures 4" x 4". 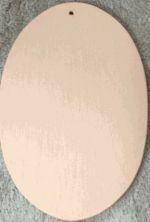 This oval ornament wood can have most any small Christmas design painted on it beautifully. Great for a gift exchange. Measures 4 1/2" x 6 1/2". Although I designed a address sign on this surface, it can be used for an array of designs. Patterns PP-480 and PP-481. Measures 24" x 7". This little moose head was designed for pattern packets PP-497 & PP-500. Measures 4 1/2" x 5". This ornament wood was designed for pattern packet PP-460 and PP-461. It is reversible and measures 4 x 5.5 inches. This lattice surface is MDF and has a multitude of uses. Both pattern packets PP-417 and PP-452 were designed on this surface. This is a puffed metal surface that has many designs from pattern packets PP-455, PP-465, and PP-479. 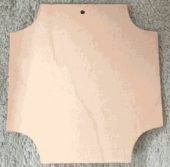 Measures 9 1/2" x 5 1/2". This is a puffed metal surface that is primered for you. I have many designs for this metal piece using pattern packets PP-455, PP-465, and PP-479.